We typically think of a volcanic eruption as a catastrophic and highly destructive event. While it’s true that a volcano can cause great devastation, it can also be ecologically beneficial by shaping habitat and fertilizing soil. Even after a major eruption, a great variety of plants and animals can quickly recolonize the affected landscape and rebuild the ecosystem. The immediate impacts of a volcanic eruption can be devastating for plants and animals, including humans. An erupting volcano can release gases, ash and magma, a mixture of molten rock, crystals and gases. Magma, called "lava" once it reaches Earth's surface, typically ranges in temperature from 600 to 1200 degrees Celsius, or 1112 to 2192 degrees Fahrenheit. Flowing lava and eruption-associated mudflows and debris avalanches can kill plants and animals outright, and also profoundly impact organisms by transforming habitat and resources. Volcanic ash, which may cause respiratory issues in animals, can also kill insects due to its sharp-edged consistency; this, in turn, affects the food supply of insectivorous birds and bats, at least in the short term. Although a volcanic eruption is very destructive, it also has benefits to the ecosystem around the volcano. Magma can contain silica, iron, magnesium, calcium, potassium and sodium, and thus the soil derived from weathering volcanic rocks and ash is often exceptionally rich in nutrients. Such soil fertility bolsters vegetation growth, aiding in the recovery of an ecosystem after an explosion. It also explains the great productivity of agricultural lands in the vicinity of many of the world’s volcanoes. The plants that grow around a volcano are instrumental to re-establishing the ecosystem. There are many ways plants return to the ecosystem: The seeds of plants may be protected in the soil during an eruption, for instance, or seeds may be deposited in an area later by wind or birds. Shrubs, ferns and other small plants like mosses are often the first to begin growing. Their growth helps break down rock into soil for other plants. Rain is also a factor in recovery, with areas that have high precipitation often recovering faster than dry areas. Specific plant and animal species inhabiting a volcano will vary depending upon the greater geographic context. For instance, the volcanic Hawaiian archipelago is isolated by thousands of miles of open ocean, mainly limiting the indigenous fauna to animals that could fly, swim or raft from distant landmasses, such as insects, bats, birds and turtles. Many of these organisms – which, by virtue of their extreme seclusion from mainland relatives, evolved into highly unique forms – are now threatened by exotic invasive species such as cats introduced by human beings. Less isolated volcanoes typically have more varied ecosystems. Mount St. Helens in the Cascade Range, for example, supports everything from frogs and voles to elk, black-tailed deer, black bears and mountain lions. Some forms of life, known as thermophiles, have adapted to survive in extremely hot environments and can actually live in volcanic conditions. Thermophiles are generally microorganisms. For example, the hot pools at Yellowstone National Park, heated by volcanic geothermal activity and often above the boiling point of water, are home to thriving communities of thermophilic microorganisms. Specially adapted enzymes, known as extremozymes, protect these organisms from the extreme temperatures. 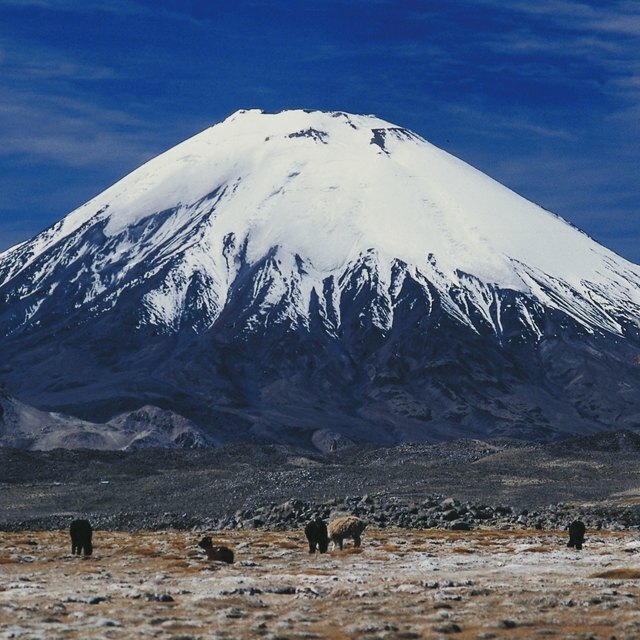 Oregon State University: How Do Volcanoes Affect Plants and Animals? Leggett, Rochelle. "Plants & Animals Around Volcanoes." Sciencing, https://sciencing.com/plants-animals-around-volcanoes-8259688.html. 23 April 2018.